Last night I accompanied the hubby to get his car stereo installed. 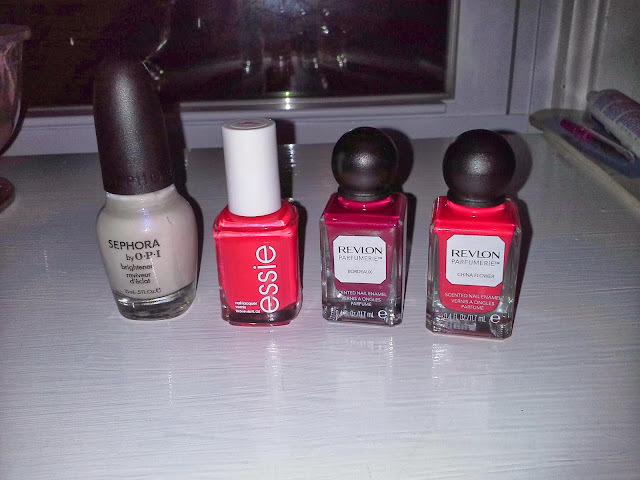 While they had the car, we walked around the mini mall, and I made a few polish purchases. At marshalls I picked up a sephora nail brightener. This is more of a sheer milky color, I don't believe it actually whitens the nail, it just gives it a color adjustment. I also picked up essie olè caliente. I had been searching for this one for a while. After marshalls we stopped at rite aid. The layout of the store was crazy, in the front of the store where you would normally find cosmetic collections were the pantyhose. I don't figure they're that big of a customer draw so it was odd to me. I found the new nailpolish displays in the back corner of the store. I was super excited to find the scented revlons, I have been waiting for come across them for a while now. They were running a bogo 50% off, so I picked up 2. I got bordeaux and china flower. I'll have pics of bordeaux up soon, as that's the one I can't wait to try!